Photography provided by Jarder Productions, Norm Lee, Ed Ng and Angelo Siglos. Although Sunday was a very long day, there was one event I just couldn't miss for several reasons. First were the two wonderful women running it - Cynthia Pace (style and image expert, host and producer) and Randi Winter (Passionate Travel). 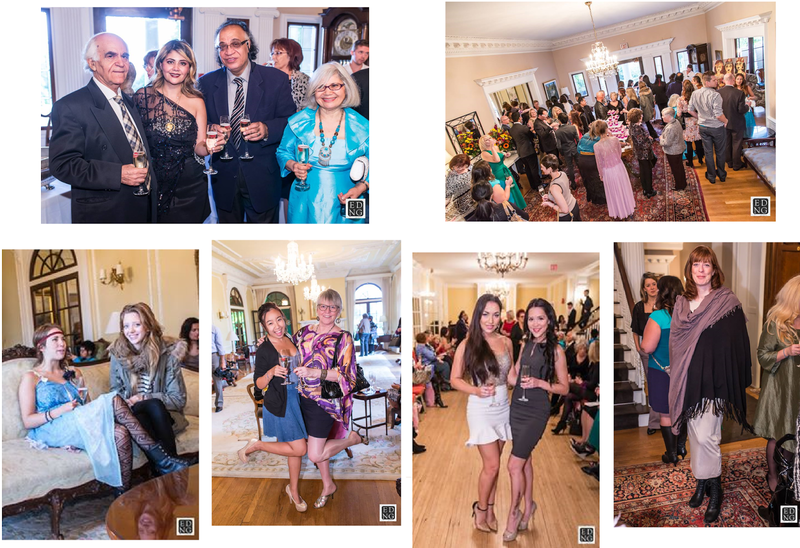 They brought all their passion to bear to create a truly special afternoon full of luxurious fashions by Maryam Asgari, classical music, champagne and dessert in the beautiful University Women's Club of Vancouver at Hycroft - a magnificent Edwardian mansion. 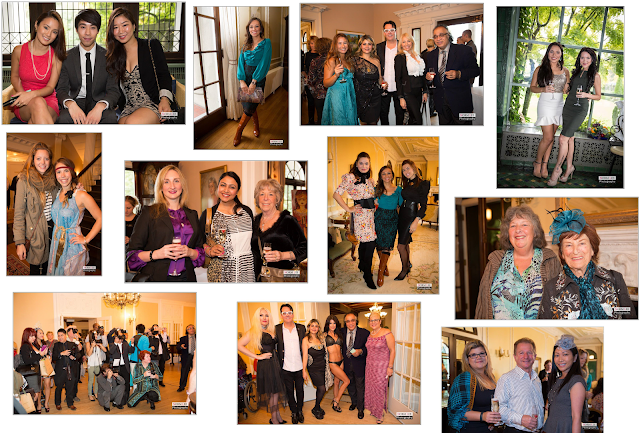 Second was the reason for the event - a fundraiser in support of The Canadian Breast Cancer Foundation - BC/Yukon Region. We have all been touched either personally or through friends and family, so 2 p.m. found me in my seat ready to enjoy. Both women fulfilled multiples roles this afternoon. 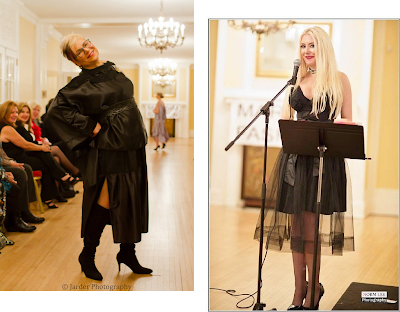 Cynthia Pace was Host, Show Stylist and MC - introducing the speakers and musical talent as well as offering commentary on the fashions and models during the show. Randi Winter was host (greeting/seating guests) and special a presenter, as well as a fashion model. This was in addition to making sure everything was running smoothly. They both pulled it off with grace, although I am sure they were exhausted once they were finally finished for the day. Opening the event was a speaker from the CBC-BC/Yukon, Rupinder Kang, who shared her own story. Shortly after the birth of her first child, a lump was discovered. After successfully battling the disease, she has gone on to become a mother of three and was there to assure us there is life after diagnosis. 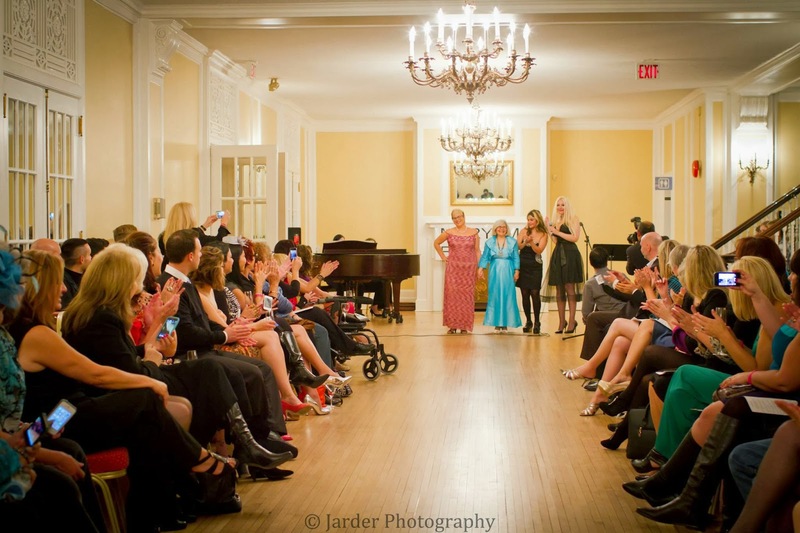 Other breast cancer survivors present included Maryam's mother and two models (one who was diagnosed at only 16), plus there was a model walking the runway in honour of her mother. Next came a beautiful opera solo by Julie Nadalini with piano accompaniment by Lesley Law - Pucini's Quando Menbo - and a heartfelt talk by Winter about the designer. I was so touched, I asked her to send me it so I could share at least a portion here. 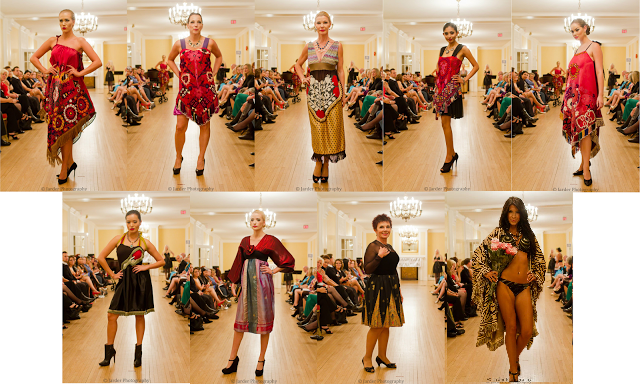 last fashion show that I saw the depth and breadth of her talent and creativity. that the clothes were for me, even though I thought that they were very special. style or period of time." Maryam Asgari was born in Iran and loved fashion from an early age. By 13 she was taking private lessons from a designer and by 22 was studying Fashion Design at the University of Tehran. Approximately 15 years ago she moved to Canada and soon earned a diploma in dressmaking and fashion design with highest honor from ICS Montreal. In 2003 she launched her own label which is known for its exclusive, one-of-a-kind designs. We were treated to two separate shows this day. 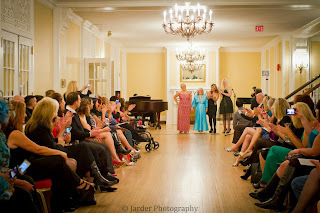 The first segment included over 25 modern, glamorous looks that ranged from dressed up daytime to luxurious red carpet. This half ended with a personal appearance by Miss Teen Canada Petite - Kathi Harder. Next came a short mix and mingle where we sipped champagne, nibbled on pink cake pops and cupcakes by I Dream of Cakes, met friends, made new connections and posed for photographs. Then it was back to our seats. 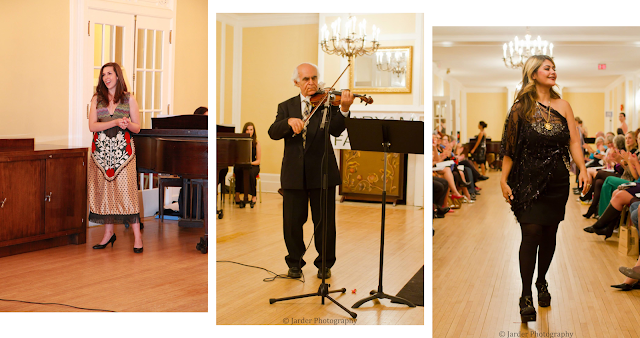 The second half began with a stunning violin solo by Maryam's father - Hassan Asgari. This was followed by a selection of the designer's unique ethnic pieces that celebrated colour and honoured her heritage. It was surprising to learn these less glittery looks were often the more expensive. Why? The materials. Many were fashioned from antique fabrics that were hundreds of years old and cost thousands of dollars. Expensive antique laces trimmed several. I think my favourite were the five looks in a deep red/black palette that came out all together - each a little different and yet a common thread that linked them. The final look had everyone sitting up and taking notice - a custom made bikini and beautiful wrap. Special thanks to the team that created the beautiful hair and make-up - Pink Orchid with assistance from Andrea Shultz & Jordan Perry, backstage dressers Pnina Shapiro, Jennifer Logan-Manzer and Ilana Bergen and all the wonderful volunteers. Sponsors for this event include - Henna by Saaj (created the breast cancer symbols), Photography by Kerri-Jo, Lord's Shoes (handbags and accessories for the show), Pink Orchid, Shopper's Drug Mart, Soul Reflexions, Purdy's Chocolatier, Hit & Run Self Defense, Dr. Sam Winter - Dentist, Black Velvet Collection (ethnic jewellery for the show), Select Wine MErchants, Debee's, Vinyl, Di Morelli, Luxe Beauty Bar and Canadian Diamond Wholesalers.